James T. Canedy, MD, President and Founder of SimplyWell, is established as one of the leaders in the personal wellness and health management arena. His commitment to healthcare and personal health improvement has helped usher in many innovative solutions to healthcare delivery and management. Part of his philosophy centers around using real metrics to measure the effectiveness of wellness initiatives and to use those measures as a basis of evidence that costs are reduced and health and wellness are increased. Additionally, he views the role of the care provider key to a personal health program, in that the data from health management programs greatly assist physicians in creating continuity of care-that wellness, health management and health care should be connected. ​Dr. Canedy is a practicing, board-certified orthopedic surgeon, a fellow of the American Academy of Orthopedic surgeons and a fellow of the American College of Healthcare Executives. 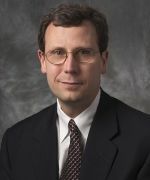 He is also Adjunct Associate Professor at the University of Nebraska Medical Center, President/Executive Director of Private Practice Associates, LLC, Board Chair of Clarkson College, Clinical Service Chief, Orthopedics at The Nebraska Medical Center and holds other board and leadership positions in the healthcare industry and in the community. Dr. Canedy is a graduate of the University of Nebraska Medical Center and University of Tennessee Campbell Clinic Orthopedic Surgery Residency Program.